VANCOUVER—American regulations that limit vessel noise and traffic around endangered killer whales off the West Coast are working, a new study has found. The U.S. National Oceanic and Atmospheric Administration, or NOAA, said in its review of regulations adopted in 2011 that the changes are benefiting southern resident orcas without having negative effects on the local whale-watching and tourism industries. The last census in July showed there were just 77 whales in the three pods that make up the population known to use the Salish Sea that includes the straits of Georgia, Juan de Fuca, and Puget Sound. “There is great concern right now about this population. There has been a loss of too many whales in the last six months to a year,’” Michael Milstein, a spokesman for NOAA, said in an interview. The Center for Whale Research in Washington state said as of December this year there were 76 whales, down from 83 in 2016. Regulatory changes implemented by the American government prevent vessels from going within 200 yards, or 182 metres, of the whales. Vessels aren’t allowed to go in the path of the whales or try to intercept them. “We know from the science that when boats are in close proximity to the whales, they don’t forage as much and possibly don’t forage as effectively, both because they’re disturbed by the presence of the vessels and possibly by the sound of the engines,” Milstein said. The study compared research and data on vessel compliance, biological impacts, and other factors in the five years before and after the regulations were implemented. It found the number of observed incidents of vessels interfering with whales dropped dramatically under the new regulations. Milstein said the changes primarily applied to smaller tourism and recreation vessels, since major shipping lanes are at a distance from where the whales frequent. 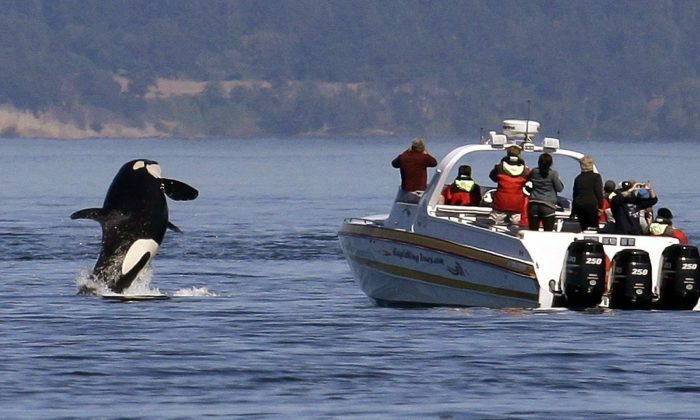 Whale watching is a lucrative tourism industry in the waters off B.C. and Washington state. There were concerns the regulations would have a negative impact on the industry, but Milstein said the study found tourism tax revenues have increased significantly. He said the study found that while most commercial vessels are following the new rules, recreational boaters tended to be in the dark about regulations, signalling a need for more public education.